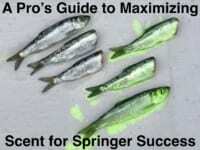 While many anglers overthink it, curing coho eggs is much easier than Chinook eggs. Coho eggs are small and have smaller skeins so I don’t butterfly them. I cure the skeins whole, which takes a step out of the process. With these eggs there isn’t this big glob of eggs. Therefore, the cure can get into the skein and into the membrane easier than a large Chinook skein. The most important thing you can do to ensure you get quality eggs is bleed the salmon out immediately. That goes with all fish, but especially coho. It’s also imperative to cure your eggs with 24 hours. If you can do that you are ahead of the game. Many ask why it’s vital to cure them so fast. Nevertheless, if you wait bacteria might set in, which ruins eggs. You want to cure them right away. Compare curing eggs to cooking. You don’t want to leave hamburgers out for hours. The key to a good burger is fresh meat. It’s no different with eggs. You don’t leave your chicken on the counter for 24 hours and you don’t want to do that with your eggs either. Bleed your fish right after catching it. Take uncured skeins and put them in a Ziploc. When you get home remove skeins from bag and roll them in paper towels. This removes excess blood and foreign debris that can contaminate your curing process. Place skeins in new Ziploc. Then, sprinkle a liberal amount of Fire Cure into the bag. Personally, I like red. However, pink is popular in the Northwest and natural and orange are more popular in the Great Lakes. Take a heaping teaspoon on Fire Power (krill powder) and dump in into the bag. I use Fire Power liberally because salmon are big krill eaters. Keep in mind, if you are fishing for hatchery coho krill is part of the food they are fed at the hatchery. They also eat it in the ocean and in the Great Lakes throughout their life. Depending on what color you are curing your eggs, I’ll take Fire Dye and squirt a half a teaspoon of it in my eggs. This makes them even more vibrant. 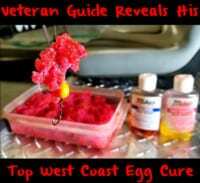 For example, if I’m curing my eggs with Red Fire Cure, I’ll use the Red Fire Dye and so on with orange and pink. Add a heaping teaspoon of granulated sugar. This makes the eggs a tad sweeter. Close the Ziploc and roll the eggs (in the Ziploc) to mix ingredients thoroughly. Let them cure at room temperature for 6-8 hours. Every hour roll the eggs in the bag to help ensure all the eggs are curing properly. Be sure not to drain the juice. A lot of that juice will be reabsorbed into the egg. At this point, place them in the fridge for 24 to 48 hours to allow the eggs to complete the process. At this point the eggs are ready to fish. However, the day before using them I’m going to take the eggs out and allow them to air dry. I place them on a screen outside in order to help them dry out and toughen up. Then I’ll sprinkle Natural BorX O Fire or plain borax on them and let them sit overnight. I do this because it helps toughen them up and they stay in your egg loop longer, and they aren’t quiet as gooey. Editor’s Note: Veteran guide Todd Daniels operates Tall Tails Guide Service. For more info on his fall coho trips please visit http://talltailsguideservice.com.